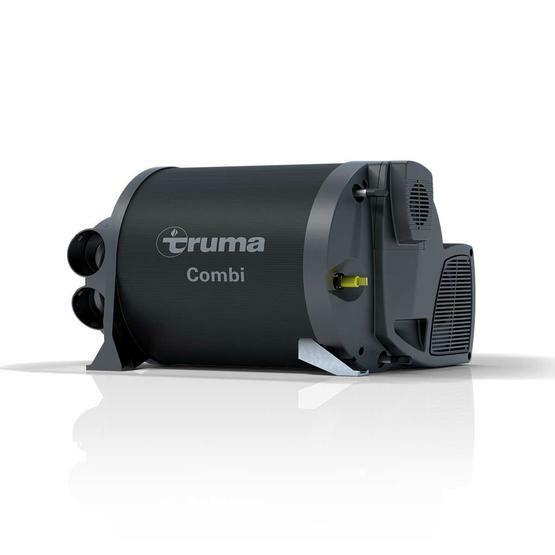 Whether you are after gas or gas and electric, the Truma Combi 6E (6000W) has the combination heater for you. Combining your hot air and water heating in one discrete unit, the Combi range offers you a highly efficient and award winning solution for your vehicle. Flexibility is a key feature of the Combi range allowing you to choose what energy source you want to be working from and what function you desire, be it just hot water, just heating or both. What comes in the box with the Truma Combi 6E boiler? - Short water heating time, but no need to cut your shower short - enjoy! Approvals for fixed buildings have changed so that Truma heaters cannot be installed in mobile homes. Our appliances are approved for recreational vehicles. Heaters that are already installed are protected by a grandfather clause. Our current appliances are approved only for recreational vehicles. Therefore, installation in an awning is unfortunately not allowed. But you can retrofit your Truma heater with an awning warmer. This directs the warm air from the existing caravan heater directly into the awning. Yes, heating while driving is possible with Truma Combi and VarioHeat heaters. With Truma S and Trumatic S heaters, operating the heater while driving is possible only with a cowl top, which must be installed freely in the air flow. Truma recommends the cowl tops T-3 or T-2. Otherwise the flame can blow back and cause damage to the heater. The cowl top must protrude at least 10 cm above roof attachments, such as roof boxes, ski or luggage racks so that the heater works properly. For heating while driving, Directive UN ECE R 122 for motor homes and caravans specifies a safety shut-off device. The Truma MonoControl CS gas pressure regulation system fulfils this requirement. Throughout Europe, a type-tested LPG heater may be used while driving (according to Directive UN ECE R 122) if the system includes this regulator with an appropriately configured gas installation. National regulations must be observed. However, with heaters that are supported by fans, we recommend that you clean the heat exchanger and the fan wheel fins with a paintbrush or vacuum cleaner before winter. If the heater has an auto ignitor, we recommend that you replace the batteries about every two years or if the ignition frequency becomes slower. Use only batteries that are heat proof and that do not leak. Exhaust ducts must always be laid rising from the Truma heater towards the cowl. If the exhaust gases from your Trumatic S still pass through an aluminium pipe, replace this with a stainless steel pipe. Please note that the pipe must be replaced by an expert (e.g. Truma service partner). To prevent heat accumulation, no warm air outlets or warm air ducts must be closed off on the Combi 6 (E). With the Combi 4 (E) no more than one warm air outlet or warm air duct may be completely closed off. But it is always better to use all four warm air outlets. Individual outlets in the same pipe may be closed only if T/Y-pieces are used and the heat can be directed to another open warm air outlet. Simply set the switch to summer mode and select 40 or 60 degrees Celsius water temperature. When the yellow LED on the control panel goes out, the respective water temperature is reached. The heating system heats only water and the circulation fan does not run. Output in summer mode is 2 KW. The water container of the Truma Combi heater may be heated also without water. This function protects the Combi heater from possible overheating caused by heat build-up. The circulating air motor gives off the possible heat build-up into the vehicle interior during the after-run period. The after-run is activated every time the system is switched off, even if the Truma Combi heater was only switched on for a short time. You cannot deactivate the fan after-run. For hygienic reasons you should decalcify the water container occasionally. Use special decalcification products from camping specialists or conventional vinegar essence or citric acid, for example. Fill the decalcifying product in the recommended ratio into the appliance via the water system, allow it to work and then rinse the Combi heater thoroughly with fresh water. Do not use the water from the Truma Combi as drinking water. You cannot retrofit the heating elements in the standard model. In the electric version of the Truma Combi heater, the heating elements are integrated in the heat exchanger. The digital CP plus iNet ready control panel can be retrofitted with all Truma Combi heaters. Truma has been producing Combi heaters since 2007, they can be recognised by the grey cover. Since 2013, they have had a black cover. The heater is started and the desired temperature for heating and hot water is set on the Truma Combi LCD control panel (1). The heater is connected to the gas supply of the vehicle via the gas connection (2). The gas supply to the heater is controlled via the solenoid valve (3). 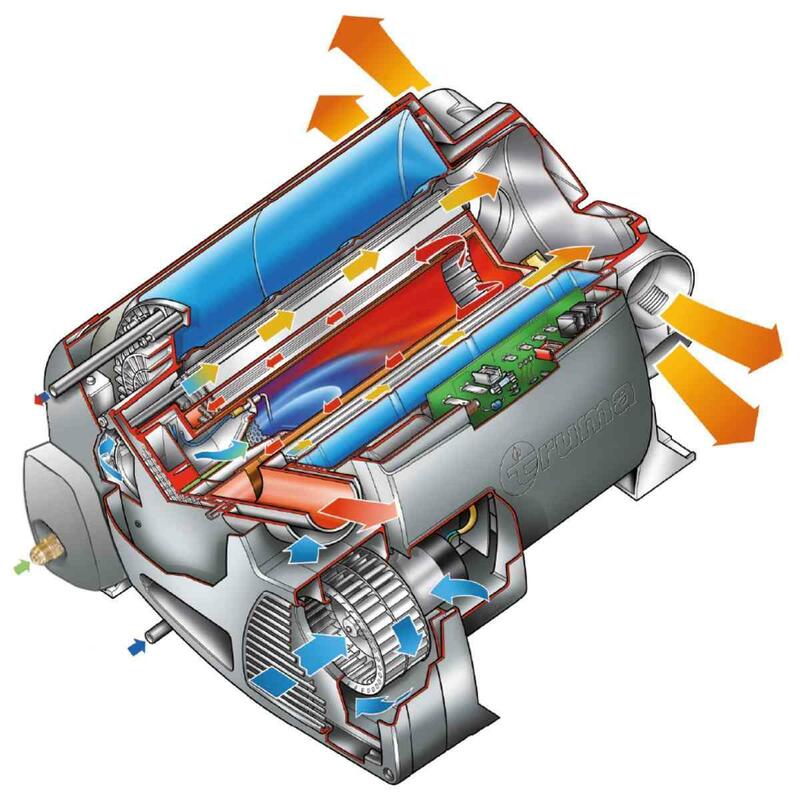 The required combustion air enters the appliance through the outer duct of the combined combustion air/exhaust cowl (4) and is fed to the gas burner (6) with the help of the combustion air fan (5). The gas burner, which has two ignition electrodes (7) and a flame rectification electrode, ignites the gas-air mixture in the combustion chamber (8). The hot exhaust gases are diverted at the end of the combustion chamber on the baffle of the flame tube (9) and flow back between the flame tube of the burner and the inside wall of the heat exchanger. They are fed to the atmosphere via the exhaust cowl (4). The circulation fan (10) blows the air that is to be heated into the appliance. There, the air flows along the fins of the heat exchanger (11) which ensures optimum heat transfer because of its large transfer surface area. Inside the heat exchanger are additional 1800 W electric heating elements (12). They can be used to heat water and/or warm air alternatively or additionally. The warm air is then distributed in the vehicle via four warm air outlets (13). Fresh water is in the outer stainless steel water container, which holds up to ten litres (14). It is heated by the heat transfer from the heat exchanger (11). Because of the eccentric shape of the water container, the warm water circulates, which ensures optimum mixing of the water and better thermal stratification. The warm water connection pipe (15) connects the Truma Combi with the hot water lines in the kitchen and bathroom. Cold water is pumped from the freshwater tank via the cold water connection pipe (16). 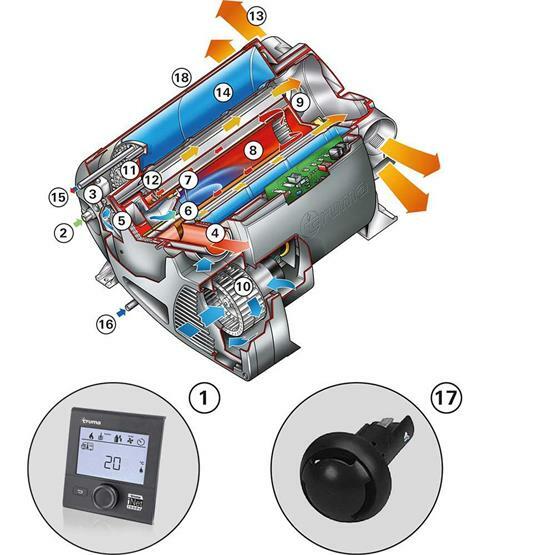 The room temperature sensor in the vehicle (17) measures the air temperature in the vehicle. The water temperature is also measured by internal temperature sensors. The appliance reduces the heat output before the desired heating and water temperatures are reached. When the set temperature is reached, the burner switches off. When the temperature falls below the set heater and water temperatures, the Truma Combi switches on again automatically to heat air and water (winter mode). In summer mode it is possible to heat up the water independently of the space heater. The HDF thermal jacket (18) provides good insulation for the Truma Combi heater. We were truly amazed with the customer service from Leisure Shop Direct. Very rarely do you come across old fashioned customer service such as this. We needed this item as a matter of urgency and nothing was too much for their after sales team. We will definitely be shopping here again. !